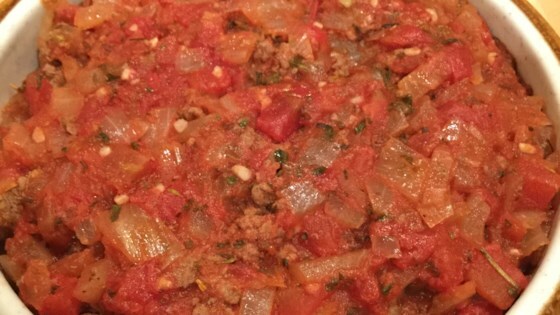 "Quick and awesome spaghetti sauce with bell pepper, garlic and onion." In a hot skillet, saute bell pepper and onion on medium-high for 5 minutes. Add garlic and saute one more minute. Stir in tomatoes and chicken broth. Remove from heat. Place mixture in blender and blend until the desired level of chunkiness is achieved. Return to medium-low heat. Stir in tomato paste one tablespoon at a time until desired level of thickness is reached. Cook for 20 minutes, stirring occasionally. It was really great. Fast and the fam loved it. Plus I usually have all the ingredients around.